On-loan left-back Callum Elder has returned to Leicester City for treatment. Photo: Joe Dent/theposh.com. 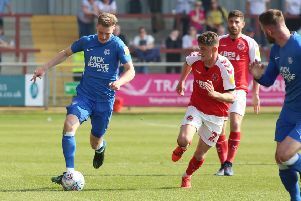 Callum Elder’s Peterborough United career is over....for now. The on-loan Leicester City left-back suffered a foot injury at Blackpool last Saturday (December 19) that will keep him out of the Posh Christmas programme at the very least. The 20-year-old Aussie has returned to Leicester for treatment. His loan deal at Posh was due to expire on January 3 anyway. Posh had hoped to extend it until the end of the season, but will now have to delay any deal until he recovers. Elder has been outstanding in his 21-game stay at Posh, but manager Graham Westley insists he has adequate deputies in his squad. Natural left-back Kgosi Ntlhe is still a month away from a return to training so Andrew Fox, who was employed as a substitute for Elder at Blackpool, will be favourite to start the Boxing Day fixture with Chesterfield at the ABAX Stadium. Westley said; “Callum has been an outstanding player for us, and a great character to have around, and he will obviously be missed. When a player of his stature and strength is forced off the pitch early in a game you know it’s probably a serious injury. “He had a scan which revealed a problem so he has returned to Leicester for treatment. He will definitely not be fit for the next two games and he might not be fit for the next 10 so we will just have to wait and see. “It’s a disappointment, but we have players in the squad who can cover for him. Everyone was disappointed and feared the worst when Marcus Maddison was injured and missed a few games, but we played very well without him. Posh have extended the contract of centre-back Miles Addison. Addison was originally signed for a month to cover a defensive injury crisis, but has impressed Westley with his improved fitness and sharpness in training.